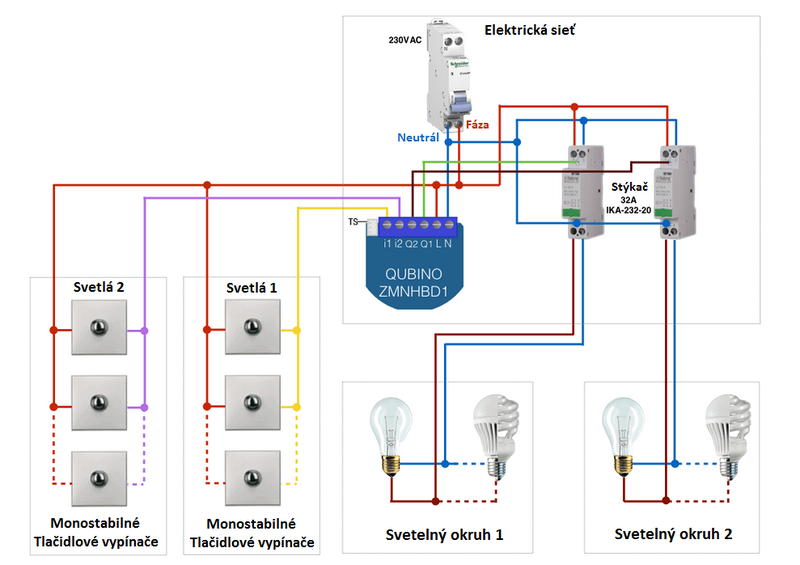 The installation of the below-mentioned connections can be performed only by a certified electrician. Even if the device (relay module or contactor) are switched off, there still may be some voltage on the terminals. During any assembly or disassembly of the device or during works with the device the fuses must be switched off. In the wirig diagrams below, the relay modules from the Qubino company are used, in particular Qubino Flush 1 Relé Plus [ZMNHAD1] and Qubino Flush 2 Relé Plus. 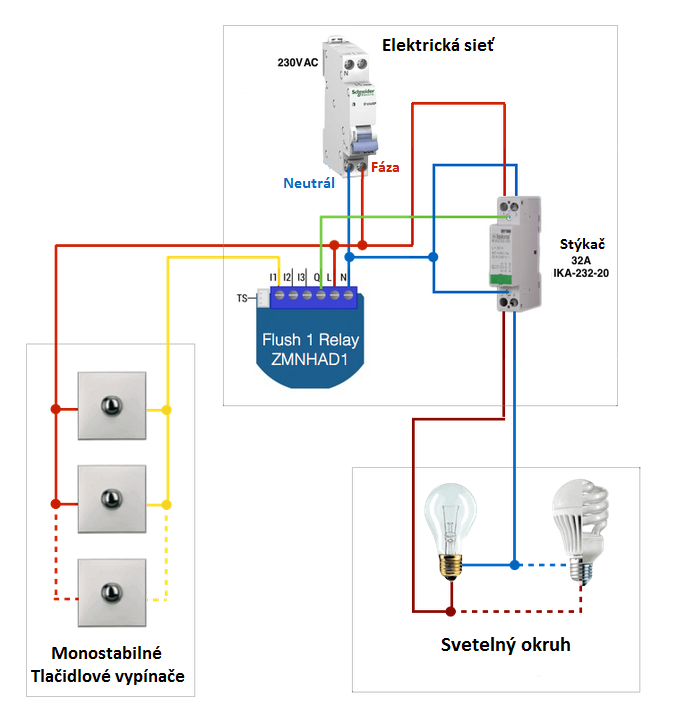 But in principle it does not matter which relay module you use, but be careful about the correct connection and the different positions of the terminals. In the wiring diagrams they also used the Qubino Contactor (IKA232-20), that is a two-pole installation contactor for alternating current from the AC1 category of contactors – for switching non-inductive or slightly inductive loads, e.g. resistance ovens. 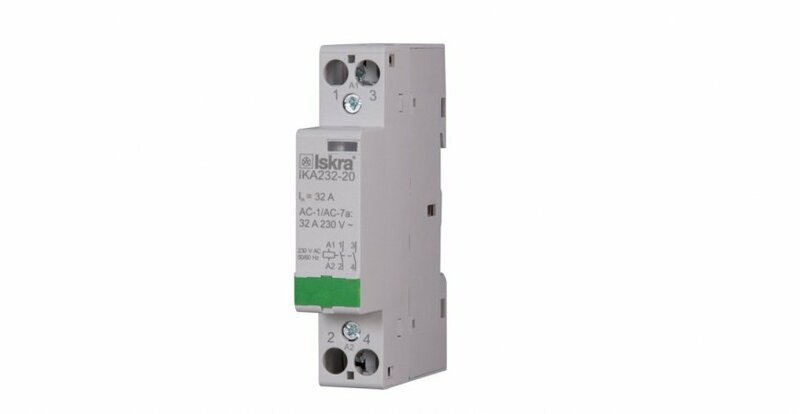 Thanks to the AC1 and AC2 terminals this contactor can be connected externally using a traditional wall switch or Z-Wave relay module, as showed in the diagrams and this allows the user to switch this contactor also remotely.
! The contactor is from the AC1 category of contactors for alternating current - for switching of non-inductive or slightly inductive loads. Then in the diagrams they used mono-stable/one-button switches (momentary switches) that can be completely let out (because the Z-Wave modules from the QUbino company are used) and they can be replaced by toggle switches. 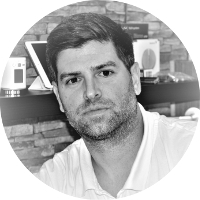 But we recommend to use also traditional switches in case there is a failure of the Z-Wave control unit when you can use a wall switch to control the contactor and thus to control the loads. Can this be a stand alone device after fuse ? Question is, in any case of fire alarm, I wanted the z-wave compatible alarm to send commando to this relay to take the fuse for supply of technical courses in that room the alarm goes. Yes of course you can use device behind fuse.